After her previous lives working in the graphic art field, retail clothing business, and as a restaurant owner, Gina Phillips is now painting full time. Close up and cropped portraits of dogs and cats; incredibly detailed, whimsical paintings of circus children; landscapes of Idaho and the mountains of Colorado; and unique floral and still life paintings comprise her current portfolio. Using various media, primarily oil paints and watercolors, Gina closely crops images of her subjects to create mood and emotion in her unique paintings. To catch and hold the viewers attention, she relies on sharp contrasts in value, texture, and color. 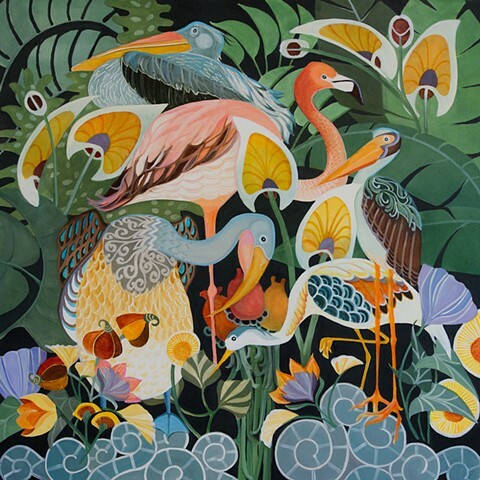 Close attention to detail and a passion for pattern, color, and design have become key elements in her compositions. Gina has exhibited her works in numerous international juried shows, has won various awards, and has received a Patrons Purchase Award in the National Watercolor Societys Annual Exhibition. She is a signature member of NWWS, IWS, and belongs to the WCWS. Her paintings are included in both private and corporate collections. Gina has entered the world of giclee prints with her Circus Children series. For information please see the Clowns section of this web site. Please visit my Etsy Shop to see the lamps I have been creating from reused, up-cycled, recycled, antique, funky, wonderful old stuff. Web site is Electric Heirlooms at etsyelectricheirlooms/etsy.com.